This place is a great mix of upscale and, for lack of a better word, “conventional” sushi spots. 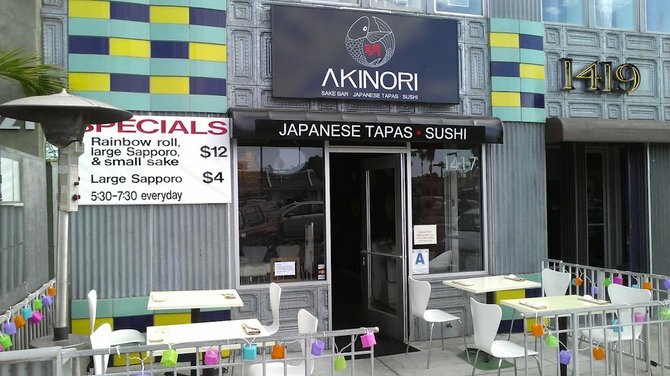 Chef Akinori is a talented guy and his sushi creations approach brilliancy when he’s firing on all cylinders. That said, it’s not just a spot for smug sushi aficionados to geek out over bluefin toro, and you don’t have to spend $70 on an omakase menu to enjoy Aki’s menu. Sunday 5:30–7pm: $.99 small hot sake, $2.50 draft beer, $7.50 sake combo (beer and sake), $12.50 draft beer pitcher. Appetizers $6.95 to $12.95. Monday 5:30–7pm: $.99 small hot sake, $2.50 draft beer, $7.50 sake combo (beer and sake), $12.50 draft beer pitcher. Appetizers $6.95 to $12.95. Tuesday 5:30–7pm: $.99 small hot sake, $2.50 draft beer, $7.50 sake combo (beer and sake), $12.50 draft beer pitcher. Appetizers $6.95 to $12.95. Wednesday 5:30–7pm: $.99 small hot sake, $2.50 draft beer, $7.50 sake combo (beer and sake), $12.50 draft beer pitcher. Appetizers $6.95 to $12.95. Thursday 5:30–7pm: $.99 small hot sake, $2.50 draft beer, $7.50 sake combo (beer and sake), $12.50 draft beer pitcher. Appetizers $6.95 to $12.95. Friday 5:30–7pm: $.99 small hot sake, $2.50 draft beer, $7.50 sake combo (beer and sake), $12.50 draft beer pitcher. Appetizers $6.95 to $12.95. Saturday 5:30–7pm: $.99 small hot sake, $2.50 draft beer, $7.50 sake combo (beer and sake), $12.50 draft beer pitcher. Appetizers $6.95 to $12.95.